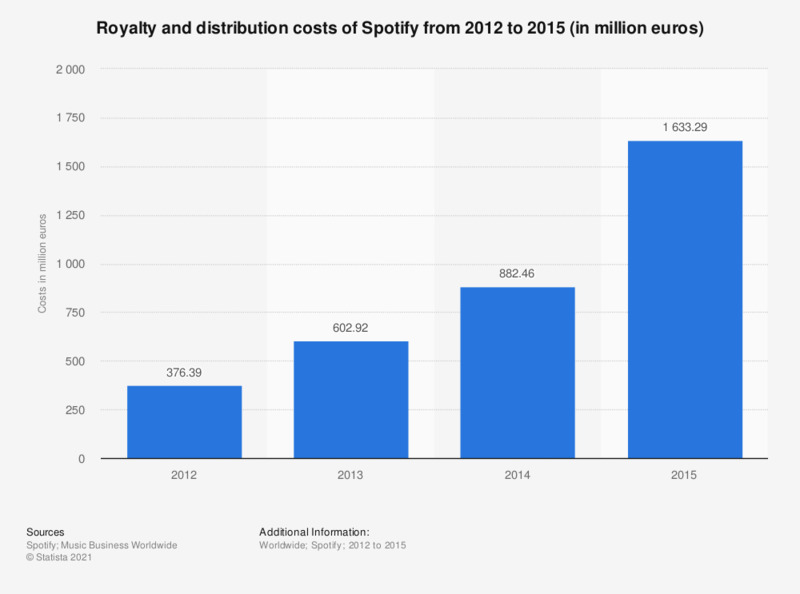 This statistic presents the cost of Spotify's royalty fees and distribution costs payable to music artists and license holders from 2012 to 2015. In the most recently reported year, the streaming platform paid out 1.62 billion euros in royalty fees. With more than 100 million monthly active users worldwide, Spotify is one of the most popular music streaming platforms. Founded in Sweden in 2006, the service was available in 59 countries as of February 2016. As of the same period, Spotify had a brand awareness of 52 percent in the United States, ranking behind local competitors Pandora, Apple Music and iHeartRadio. The music streaming service operates under the freemium business model, with basic services being free and additional features such as offline mobile support and ad-free listening offered via paid subscriptions. Spotify generates the majority of its revenues via subscriptions – in 2015, subscription revenues amounted to 1.74 billion euros, representing a 78 percent growth from the previous year. In March 2016, Spotify reported having 30 million paying users. Despite all of this, the company has yet to report a profit, as the most recently reported net loss amounted to over 173 million euros. Like YouTube, the company has a contentious relationship with the music industry. Critics argue that artists and music rights holders are not compensated adequately for their music streams. In 2015, digital music accounted for 6.7 billion U.S. dollars of recorded music market revenues worldwide, surpassing traditional music sales and arguably reviving music sales overall. Nonetheless, streaming experts find that the compensation of artists via digital royalty fees is still lacking when compared with streaming platform revenues and the number of streams.